I am officially in the holiday mood, which means that I am blasting Christmas carols in the car, baking ALLL the gingerbread cookies, and watching every single made-for-TV holiday movie ever created. Oh, and wearing my holiday PJs while doing all my holiday activities. But my absolute favorite thing to do during the holiday season is curling up on the couch and sipping on a mug of hot chocolate. But it can’t be just any hot chocolate. Ever since my study abroad experience in Italy, it has to be ITALIAN HOT CHOCOLATE. 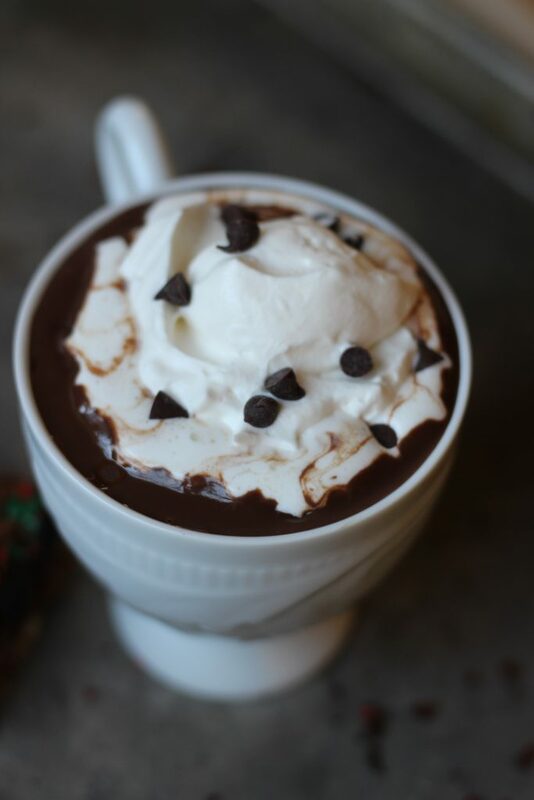 What is Italian Hot Chocolate? It is probably the best hot chocolate in the world! The beverage is thickened with a cornstarch slurry, which turns it into the consistency of thin cake batter. 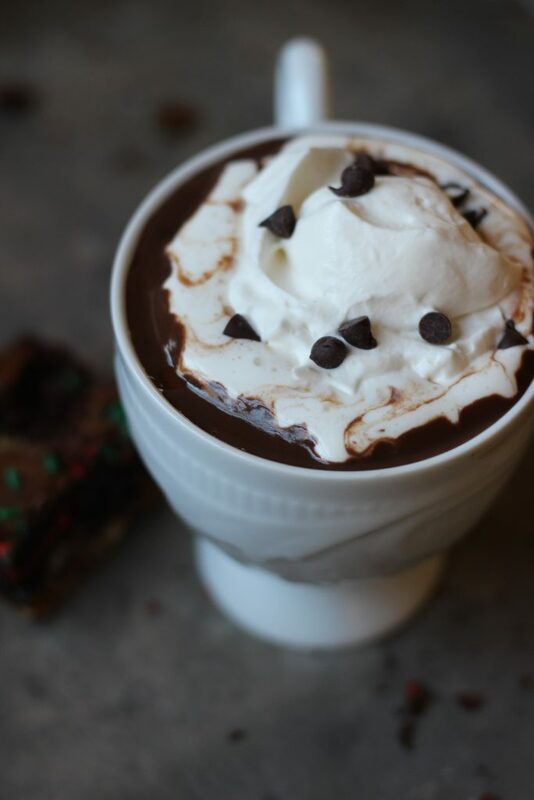 It’s decadent, dreamy, and the perfect way to start a cold wintery morning. Since it is the holidays, I lightened up the traditional recipe a little bit (because you need to save room for Christmas cookies too!) and used ingredients that are readily in your pantry. Because who wants to change out of their PJs and drive to the store for ingredients at 7AM? 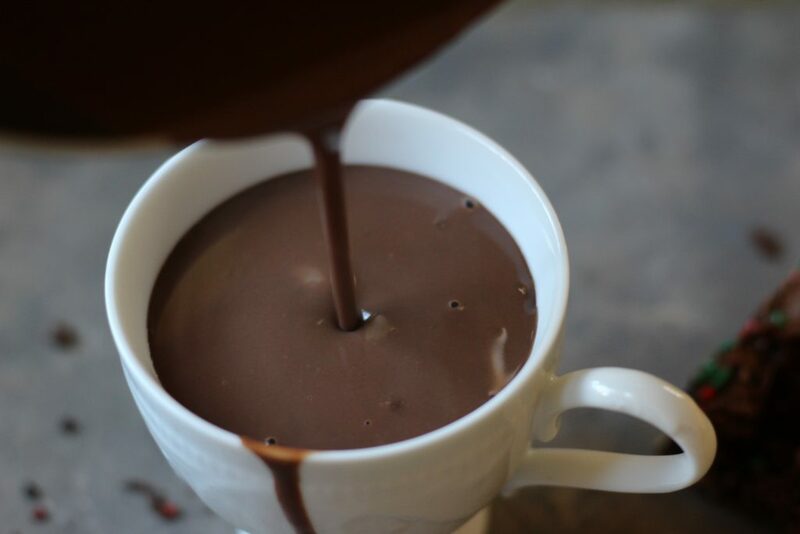 The Skinny Italian Hot Chocolate starts with the dry base. 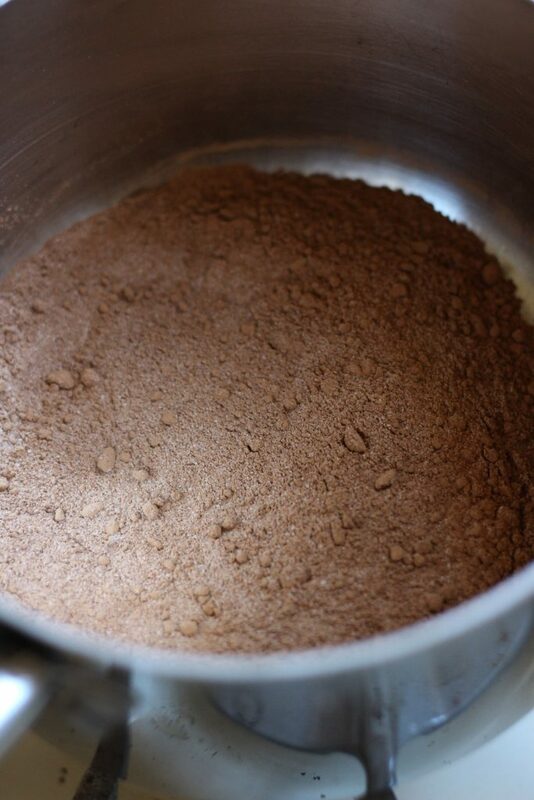 In a small saucepan, combine unsweetened cocoa and granulated sugar. Add in a sprinkle of salt (to combat all the sweetness) and whisk everything together. Place the saucepan onto the stove and turn the heat onto medium-low. While whisking constantly, add in one and a quarter cups of skim milk. Continue to whisk until the milk is very hot (but not boiling!). Add in a cornstarch slurry (skim milk + cornstarch) and continue to stir (I switched to a silicone spatula) until the mixture is thickened, about 2 minutes. And add a generous dollop of lightly sweetened vanilla whipped cream (heavy cream + sugar + vanilla extract). Oh, and garnish with mini chocolate chips if you want to (and you will want to!). The perfect way to keep warm this holiday season! Simply A (RD) Fact: Did you know that cocoa is a good source of dietary fiber? In a small saucepan, combine cocoa, sugar, and salt. Whisk together. Place saucepan on stove over medium-low heat. While whisking constantly, add in 1¼ cup skim milk. Continue to whisk until milk is hot but not boiling. Combine one tablespoon skim milk and one teaspoon of cornstarch - stir to combine. Pour cornstarch slurry into the cocoa-milk mixture. Continue to stir hot chocolate until thickened, about 2 minutes. 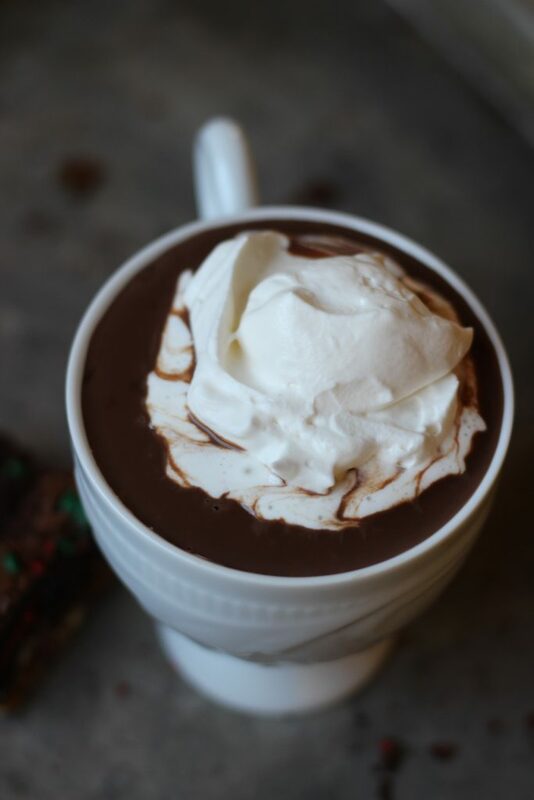 Pour hot chocolate into a mug. Top with optional whipped cream and mini chocolate chips.